An interview I conducted with Penny D. Owen, author of A Love That Never Dies which was published by PublishAmerica, and Love Beyond the Grave, published by Lulu.com. Can you give us a basic summary of A Love that Never Dies and Love Beyond the Grave? A Love That Never Dies is a love story about a woman named Patricia who had never known true love until she met Rob. He made her understand the true meaning of unconditional love. They felt as if their love could overcome all obstacles that they knew they would face. Rob was trying to get a divorce and custody of his son. Patricia stood by his side every inch of the way. As the saga continued, the day to go to court also came around. Once Rob lost custody during his court hearing, his feelings for the woman that he had promised his undying love for changed. He walked out of her life and was not heard from until many years later. Patricia and Rob finally did find each other again, but Rob had decided that he liked his life the way it was, uncomplicated and single. Patricia went on to marry a wonderful man who fulfilled her every want and desire, but she never gave up her love for Rob. After sneaking around and seeing each other for a while, Patricia finally realized that she had to make a choice. By the time she went back to talk with Rob about it years later, Rob was gone. It was too late to let him know how he had touched her life. 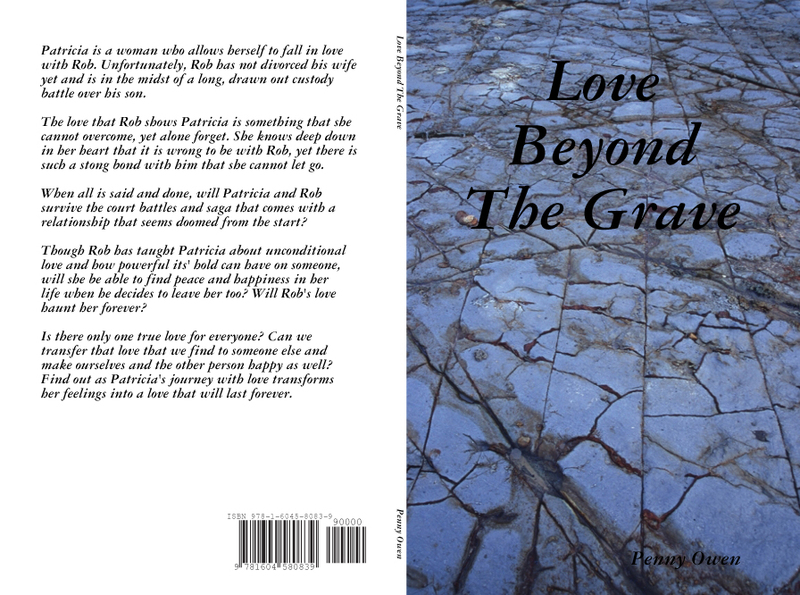 The sequel is called Love Beyond The Grave and has just been released. It is the continuing story of how Patricia had to learn to live without the one man who had taught her so much about undying, unconditional love. Patricia finally realizes that she had been wasting her time and energy longing for someone that she would never have as anything but a wonderful friend. She decides to tell her husband, Doug about a man that has been such a strong force in her life, when he has a heart attack and nearly loses him. That's when she realizes that her true love all along has been right in front of her face. He has been the one giving her unconditional love that Rob taught her all about. How long did it take you to write each from start to finish? Because they were both novellas, it probably took me about 3 to 6 months to write each one, including all the changes and revisions. Did you do any research while writing? If so, what kind? No, there was no research done. My books are about love and romance. That comes from the heart. Yes, there were people in my life that may have given me ideas or even inspirations in these books, but nothing else. Are there any authors or books who inspired you as a writer? As an author, I enjoy reading, when I have the time, anything about love and romance. Tory Lynn has written some excellent works about love, as well as well known Nicholas Sparks. I also work with another author, who has written some wonderful books that have inspired me. Do you keep a strict writing schedule? Because of my other full time job, writing for me is something that I do to release stress. Most of my writing is done on weekends or whenever I'm traveling around doing my other job. I'm always coming up with ideas for books and I write down those ideas so they don't get lost somewhere in head. Later, I go back and start working on them. My books are definitely geared to those who are true romantics. They are also intended for mature audiences. There's nothing shameful or vulgar in my books, but I think you have to be mature enought to feel the connection between the characters and put yourself in their places to understand the stories. I guess when I was younger, one of my favorites was To Kill a Mockingbird. Now, I read just about anyone's books that have something to do with love, romance and mystery. Unfortunately, I don't have as much time as I would like to do that. PublishAmerica has so many talented authors that I couldn't begin to name them all. I have read so many of their inserts from their books. I have been blessed to know these people and to learn from them as well. I am a true romantic at heart and I want my books to touch the heart and souls of all who read my books. I hope that they will check out my website at www.twinriverspublishers.com to find out more about me. I currently have two new books in the works. One is about a young girl who marries at a young age and finds out that the man she loves is not the man she married. When she becomes preganant, he turns more and more to his alcohol to drown out his life with her. He becomes violent with her and she almosts loses her baby. She has to find the courage to find a way to save not only her life, but her unborn child as well. It's almost a self-help book for women in abusive relationships. The other book is a romance mystery set in a town in Ohio. With a new stranger in town, no one will ever suspect who the real murderer really is. Write! Just sit down and do it. You never know when one of your books could turn out to be the next best seller. As mentioned above, please see Penny's website at www.twinriverspublishers.com.